Road transport has always been a key sector for European GNSS, but safety- and security-related applications bring special challenges along with the opportunities. European Union (EU) officials speaking at a conference in Brussels last week explained why. 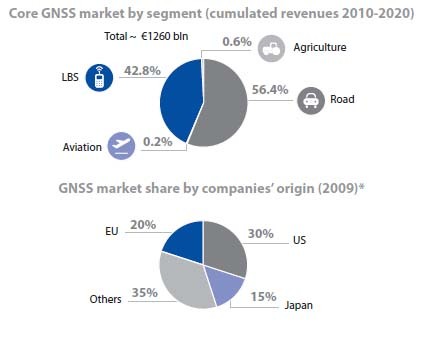 Part of the GSA’s remit is to point the way to new opportunities for European GNSS businesses and small entrepreneurs. Calini said that the GSA sees lower data connectivity costs opening news doors for developers of all kinds of applications and devices with a substantial overlap between in-vehicle navigation and location-based services markets. E-Call, for example, the automatic emergency call system, set for launch in 2015, Calini said, should be a priority for anyone wanting to make inroads into the road transport market. “With 200 million vehicles in Europe that need to be equipped with GNSS, this is an enormous opportunity for the industry,” he said. Calini pointed to ongoing EU support for research and development, citing in particular the SCUTUM project, which is developing tracking and tracing technologies for dangerous goods; COVEL, which is focused on lane-level road navigation, and the GNSS-based driverless TAXISAT vehicle. The Brussels conference was essentially aimed at reminding all interested parties of what is happening, what is needed, and, by extension, what opportunities are out there for clever developers, suppliers, and service providers. Highlights included a session on dangerous goods transport, with Telespazio’s Antonella di Fazio outlining the results of the SCUTUM project, and a session on road tolling, which heard Miroslav Bobosik, head of strategy and marketing for Slovakia’s SkyToll explain how his country’s electronic tolling systems went from having about 2,500 kilometers to nearly 18,000 kilometers covered by its road charging scheme within just one month, thanks to GNSS. The digital tachograph also merited its own session. Panelists agreed that GNSS is the obvious solution for updating this recording instrument for haulers mandated by the EU since 1985. Fleur Breullin, policy officer for the EC’she Directorate-General for Mobility and Transport (DG MOVE), and Daniel Lopour, a GSA market innovation officer, focused on freight transport and logistics. Of particular emphasis was the e-Freight initiative, a system that incorporates GNSS and other technologies to provide paperless exchange of freight information, aimed at simplifying, rationalizing and securing pan-European goods transport. Douglas Hill, COO of GS1 Denmark — “the barcode people” — summarized the work of his group, which is part of a non-governmental trans-European harmonization effort. “We operate the largest supply chain standards system in the world. Virtually anything you can buy has a barcode,” he said, and part of that code today is the “global location number” (GLN). With an appropriate GNSS-equipped reader, Hill explained, you can scan a product barcode and determine whether the object is where it should be — in the right country, in the right shop, at the right time. Hill said GS1 is now working closely with the GSA. “One of our goals is to use GNSS in GS1 products in a visible way,” he said. GS1 and the GSA will carry out joint promotion and communication actions, to let people know about their efforts. Euro-GNSS (shortened by some speakers to E-GNSS) is going to mean at the very least a new level of precision, Hill added. The ability to put this more precise info/data to good use, to create more precise virtual locations and geofenced zones — this is the added value of E-GNSS. Curiously, although all of the logistics panelists seemed eager to address the question, none of them had a particularly satisfying answer. Breullin referred to data protection tools and restricted access rights under the e-Freight system. Hill mentioned that GS1 takes the issue of counterfeiting very seriously, meaning fake barcodes and RFID chips, and so forth. ARIC, as it turns out, was part of a recent EU project that developed a low-cost GNSS jammer detection system for use in road transport and other critical applications. Lopour responded, arguing that Galileo’s authentication feature in its yet-to-be-fielded Commercial Service will do the job. This was the only reference during the discussion to the Galileo commercial service, once a chief selling point that is now hardly ever mentioned. Nothing has ever stopped European entrepreneurs, of course, from developing new products and services based on GPS alone. However, the promise of Galileo, as a high-profile and independent European system, has always been that it would serve to stimulate, encourage, and even inspire European businesses to take the plunge. And now that Galileo appears to have some positive momentum, Calini says confidence is growing. Although Calini mentioned that the GSA is working closely with receiver manufacturers, Galileo must still distinguish itself in the pantheon of GNSS systems. After wondering aloud whether “GPS” isn’t already trademarked, Lopour admitted that there is still a need to better market European GNSS, to better explain the added value to users. Speaking for the European Commission, Christian Siebert, stayed on message, reminding the conference that Galileo early services will be launched in late 2014/early 2015. Siebert, head of the commission’s Directorate-General for Enterprise & Industry’s Applications, Security and International Cooperation Unit, said the introduction of these early services will be “gradual,” the first time we have noted this wording. This gradual evolution will allow interaction with and feedback from users, he reasoned, as well as parallel infrastructure deployment. Among the Galileo services’ unique features will be the “return link” under the safety-of-life service, allowing victims to send information to rescuers, in addition to a still-notional commercial service and the secure public regulated service (PRS) already tested over the air. She also agreed that while Galileo has seen its ups and downs in the past, a positive message is important and confidence seems now to be growing among entrepreneurs.